Dangote Refinery Set To Commence Operation In 2020 – Royal Times of Nigeria. 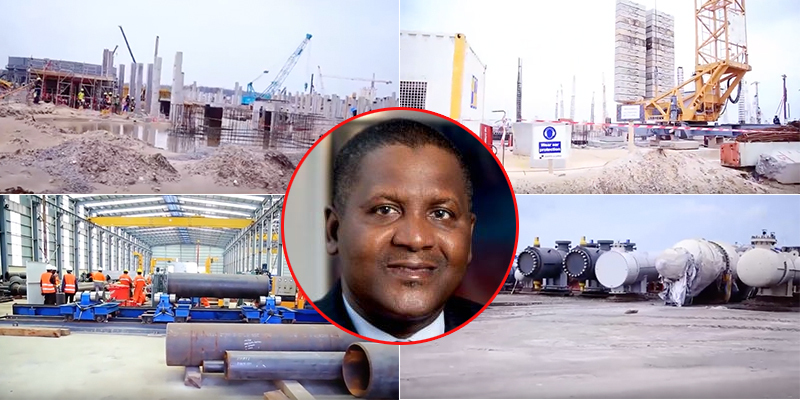 The largest single train refinery in the world, Dangote Refinery, will commence operations in April 2020, according to the President of Dangote Group, Aliko Dangote. Speaking with journalists in Lagos at the weekend during an inspection of the projects by the Governor of Central Bank of Nigeria (CBN), Godwin Emefiele, Dangote pointed out that the projects, will transform the Nigerian economy from net importer of refined petroleum products to net exporter of petroleum products. The project include 650,000 barrels per day (bpd) refinery, 883 KPTA polypropylene plant, 3million tons per annum Urea plant and 1,100 km sub-sea pipeline infrastructure. According to him, “the projects will make Nigeria to become the largest exporters of fertilizers in Africa, largest exporter of petrochemicals and biggest exporters of refined petroleum products in Africa. On his part, the CBN Governor, Godwin Emefiele, commended Dangote for his resilience and dedication to create wealth. “It may interest you to know that we expend one third of our total foreign exchange obligation to import petroleum products. When the fertilizer plant commences operation in April this year and the Refinery commences operation in April 2020, we will have a lot of savings from foreign exchange. In near future, we may be buying foreign exchange from Dangote,” he said. Emefiele urged other private refinery licensees to develop capacity and strong will to build more refineries. “I have not seen any licensee approach the bank for credit to build refinery. Remember, such licensee will approach his bank which will in turn assess his capacity to build such refinery and such request will be forwarded to CBN for approval. If they have the capacity, we will support them through their banks. It would be recalled that the Refinery was initially scheduled to come on stream in 2018. When the deadline wasn’t met, it was reschedule to commence operation by first quarter (Q1) of 2019 and it was on this assurance that the Minister of State for Petroleum Resources, Ibe Kachukwu, avowed that if Nigeria doesn’t attain self-sufficiency in 2019, he would resign. Unfortunately, Dangote Refinery will now come on stream latest April 2020 while the fertilizer plant will come on stream by April 2019.